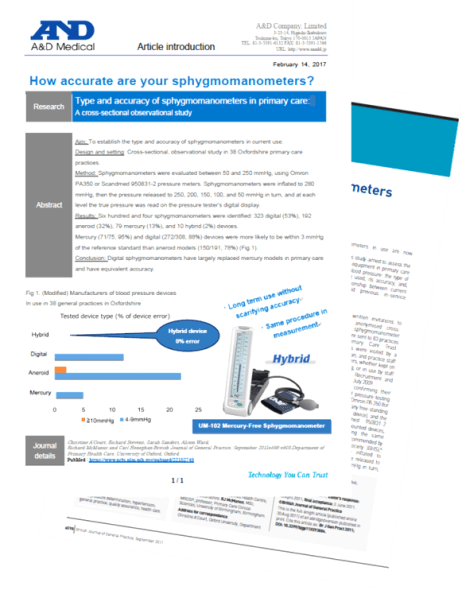 The UM-102 mercury-free sphygmomanometer continues the new era of professional blood pressure measurement. In 1905, Dr. Nikolai S. Korotkov introduced his theory of blood pressure measurement using the Riva-Rocci mercury monitor. Since then, blood pressure measurement using the mercury column has been reigned as the gold standard of blood pressure measurement, and his method known as the Korotkov method or auscultatory method is used for daily blood pressure monitoring by healthcare professionals worldwide. Recently, awareness of the issue of environmental conservation has been increasing and the use of mercury has become a worldwide concern. Mercury is a toxic metal that can poison whole communities and remain in the local environment for many years creating serious health risks. Therefore, the banning of mercury is essential in order to maintain a clean and safe environment. 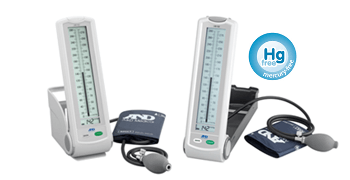 As a leading manufacturer of blood pressure monitors, A&D is responding to the call from the international medical community to ban the use of this toxic metal and has developed a new, highly advanced digital blood pressure monitor. The UM-101 and the new generation UM-102 have been designed to be used as an alternative to the mercury column, while at the same time preserving the local environment and creating an easy-to-use product for hospital personnel.